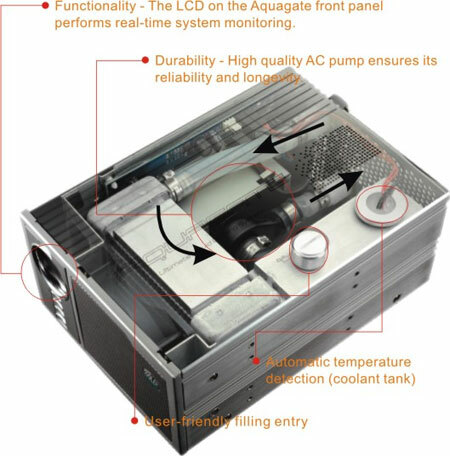 The Aquagate Liquid Cooling System is a revolutionary form of heat management for desktop computing platforms. It relies on a special liquid coolant, in order to draw heat away from the CPU and keep it as cool as possible. This unit has an LCD disply that shows you real-time system monitoring results. There is customizable water temperature, CPU temperature warning and a low water level display. This system can be mounted many different ways including on the front of the case using up two 5.25' bays, in a spare PSU bay, or as a stand alone unit. The adjustable Fan Speed fulfills both low noise and high performance characteristics. The included water block is compatible with AMD K7, K8, Intel P4 and various other specifications.